A year and a half ago, sprinter Kyle Webb was in hospital, fearing his track days might be over. A motorcycle accident in Southampton left him with a lacerated liver and kidneys, and a punctured lung. But his superb performance at the CAC Junior Championships in Mexico last week confirmed his athletics comeback. He then collected a bronze in the finals, running 10.55, despite tweaking his hamstring during the race. But Webb, who is currently talking to colleges in the US about continuing his studies, believes the hamstring strain was just a sign of his new speed. “I had a little hamstring tweak in the finals, just because my body was being pushed to the next level,” he said. Webb will be Bermuda’s sole competitor at the IAAF World Junior Championships in Oregon from July 22, having qualified for the 100m, 200m and 400m, although he is unlikely to race all three at the meet. His joy is understandable after his burgeoning career suffered an enforced time out after the accident, which left him in hospital for just over a week. He says it has given him a new sense of perspective and added to his motivation to make the best of his ability. “I took the whole season off. I was training but I only participated in one track meet. I feared I wasn’t going to be able to run again but I found out I could have actually died so I was more worried about my life. [To be doing this now] it’s a blessing. I don’t take things for granted. Beyond Oregon, Webb has his sights set on Rio 2016 — “it would be a great experience” — and Tokyo in 2020, which he believes would see him at his peak. 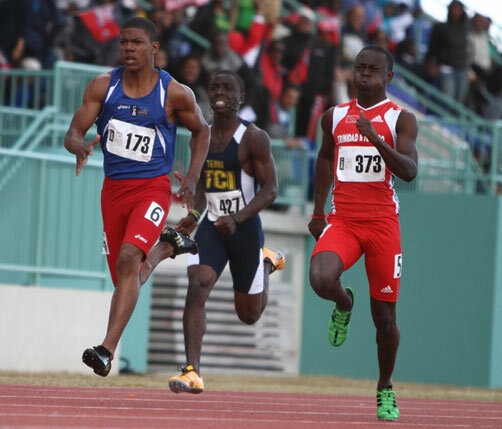 In the meantime, though, he’s desperate to add the 200m Bermuda junior record, set in 1977, to his 100m and 400m.